I used to be a baker, and despite the health advantages and the wide range of new food options, one of the things I miss while being on a low carb high fat diet is the time I used to spend baking. Over the years, I developed a number of very useful techniques. 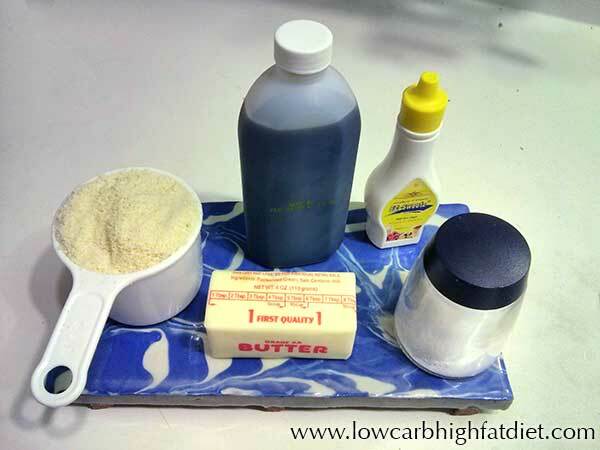 Now that I’m eating in a low carb high fat way, most of those techniques involving flour based products aren’t very useful. However, some of my training does come in handy. Of course, on a low carb high fat diet, there is no flour and no sugar. Finding appropriate substitutions for different recipes is always an interesting challenge for me. 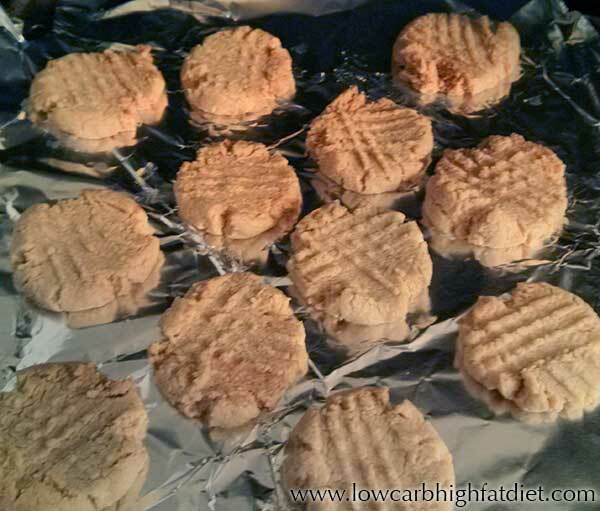 With shortbread, one of the most obvious substitutions is almond flour. I buy my finely ground almond flour, made from blanched almonds, at the grocery store. It’s actually cheaper to buy it in bulk than it is to get the packaged kind, although I should work just fine for this recipe, as long as flour is very finely ground. Using almond flour, I don’t have to use quite as much butter as I would like to. 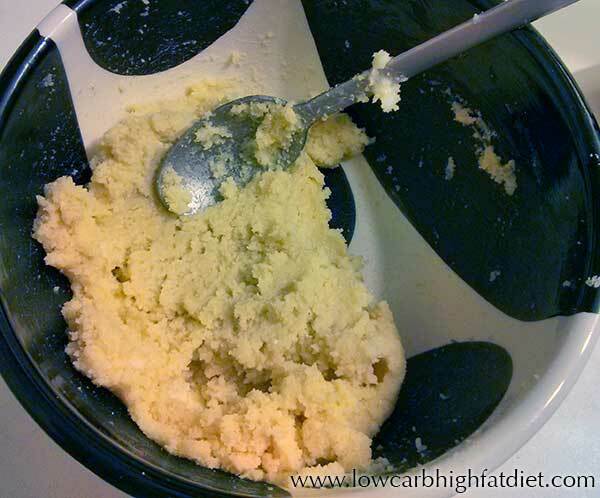 Of course I try to push the healthy saturated fat as much as I can on this diet, but when you mix too much butter with the already fatty almond flour, you end up with something a little too runny and messy. So I use half the butter that I would normally use in my shortbread recipe, and I substitute the granulated sugar sweetener that I used to use with liquid Splenda. The sugar in my original shortbread recipe is usually less than 1/3 of a cup, really only a hint of sweet flavoring. You don’t want your shortbread to be too sweet. And for practical reasons you also don’t want too much sugar because it gives the shortbread a strange crispy consistency. The liquid Splenda I add is such a tiny bit, but it adds exactly the right amount of sleep. You start with the almond flour, mix in a half a stick of softened butter, and then a dash of salt, one half teaspoon of vanilla, and 10 drops of liquid Splenda. That’s right, 10 drops. That adds up to a little bit less than a quarter of a teaspoon. If you use more, the sweetness is too cloying. You mix all the ingredients in a bowl, and then roll the dough out into 12 equal sized balls, which you place on a baking sheet, and bake at 300 degrees for 5 minutes. After 5 minutes, you take the sheet out of the oven, and using a fork you flatten the balls crosswise, making the balls flat. Then you put the sheet back in the oven, and bake for about 15 minutes more, until the edges of the cookies are brown, and they’re starting to crisp up. 4. Mix in the vanilla, salt, and liquid Splenda. 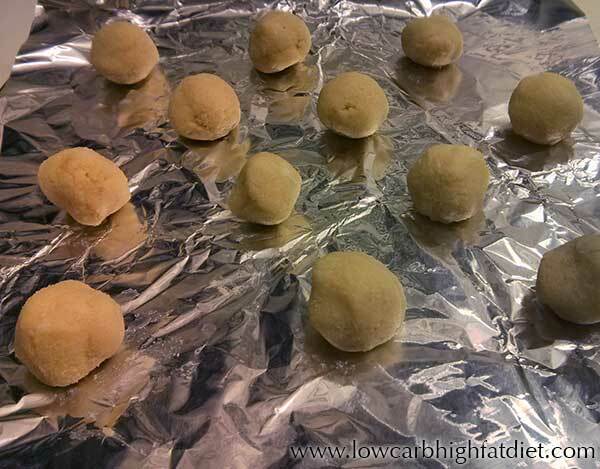 5. form 12 round balls on a baking sheet from the dough. 6. Bake for 5 minutes at 300 degrees. 7. Flatten the balls with a fork making a cross pattern on top of each. 8. Continue cooking for 15 minutes. 9. Allow to cool before removing from cookie sheet. 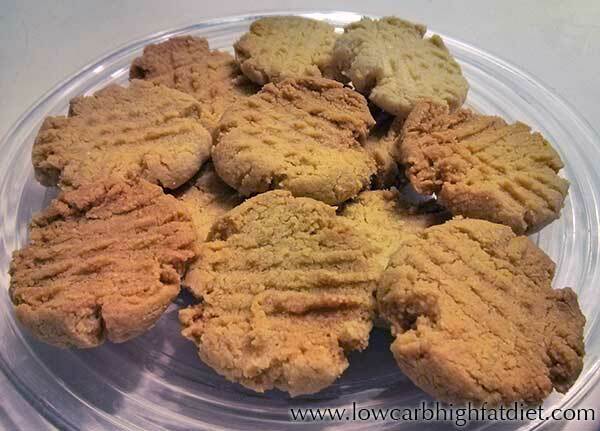 These almond shortbread cookies will satisfy anyone who is familiar with shortbread. They’re crumbly, not terribly sweet, have a familiar crusty texture. I like to have one or two with a cup of tea in the morning. This is a low carb, high-fat snack that you can really enjoy. Hi, how many grams is a stick of butter please? I believe it’s 113 grams. I made these cookies this evening. Mine were not stiff. They were very runny. I was worried that 1C Almond flour may not have been enough for the amount of moisture in the dough. Mine are wafer thin because they seemed to have “melted” in the 300 degree oven. Hi Cindy. I can think of two possible reasons why that might have happened. Might you have used a full stick of butter instead of a half-stick, or substituted erythritol for the liquid sweetener? Well DUH! hahaha I used 1/2C of butter rather than a 1/2 stick. That would explain it. And now I know. And now I am giggling at my flat wafer cookies. haha. Thank you. I will try again and repost the results. Tiffany, I have made several batches of these cookies and we all love them. Everyone does. The first batch that was made incorrectly turned out on the crispier side and very waffery. I used them in the layers of a tiramisu. They were great. I just made these and they are delicious! I don’t usually make a lot of low carb treats because I think they sometimes cause me to crave things I shouldn’t have. These are not that sweet but just the smell while they are cooking is enough of a reason to make them. It was so quick and easy and I had everything on hand (even room temperature butter). Wonderful, so glad you liked them. And you’re right, the aroma while they cook is a real pleasure. The carbohydrate count for the entire recipe is about 24 grams, depending on the brand of almond flour, of which 12 grams are dietary fiber. That leaves just 12 grams of effective carbohydrate for the whole recipe. If you make 12 cookies, each one will have just one gram of carbohydrate that should be counted. Is it possible to replace the liquid Splenda with powdered Stevia? Absolutely. The liquid form is convenient, but use your preferred sweetener (or a combination). Can you use this mix for cookie cutters? 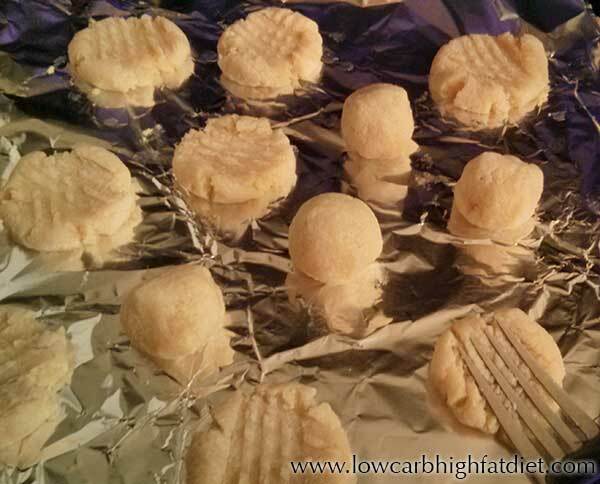 I’m wanting to make a shortbread Christmas tree, but I’m LCHF, so trying to make Christmas eats that are keeping within the nature of this way of eating. Also, can I replace the sweetener here with xylitol? How much would you suggest? Cookie cutters might work, but the dough could be hard to roll since it’s a little crumbly. If you try it, I’d love to see how it works. But I’d be cautious about xylitol if you want clean shapes. Like most sugar alcohols, it will tend to melt during baking and make the shapes run.